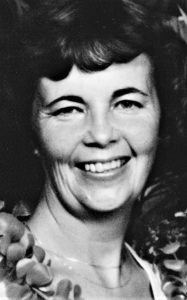 LORRAINE HARTLEY, precious mother, grandmother, and great grandmother graduated from this life on October 7, 2018, and has been reunited with her loving husband, Lowell Hartley, as well as her mother, father, and many other family members. Lorraine was born December 12, 1932 in Kamloops, B.C. She left us peacefully early Sunday morning, October 7, in Cardston, Alberta after a long battle with Alzheimer’s. She was surrounded by her five daughters and lifted by the spirit and prayers of her three sons. Lorraine was very active in the community and in the Church of Jesus Christ of Latter Day Saints, serving faithfully in many callings. She had the voice of an angel, often singing at weddings, church functions, and yes… at many funerals. She loved her children and grandchildren and passed on her love of culture, travel, music, and learning to them. Family was everything to her. She was a wonderful, devoted mother to her 8 children, 38 grandchildren, and 35 great grandchildren. Lorraine Terry met Lowell Hartley in Hartleyville in 1951 when she came down from Edmonton to live with her Grandma and Grandpa Fisher in Hill Spring while teaching in the old Hartleyville school. It was love at first sight and they were married in 1952 in the Salt Lake City Temple. It was the beginning of a great love story. Lorraine supported and loved her husband through the adventure of many moves and job changes. Though he passed away in 1988 she continued to lead a productive and joyful life including a mission to Arizona. Lorraine struggled in her waning years to be able to express herself with Alzheimer’s blocking her ability to communicate with words. In spite of these limitations, she never lost her ability to communicate clearly through her loving spirit, smile, and demeanor. She touched the lives of many and she will be missed dearly. Lorraine is survived by her brothers, Roy (Sharon) Terry, Bill (Sylvia) Terry, her sister Barbara (Duncan) Russell, and her 8 children: Debb Steele, Ron (Michele) Hartley, Laurel (Bruce) Finlinson, Larry (Miralee) Hartley, Carol (Dave) Remington, Gerald (Carolyn) Hartley, Gale (Chris) Bray, Leslie (Casey) Sloan, as well as 38 grandchildren, and 35 great grandchildren. The Funeral Service will be held at The Church of Jesus Christ of Latter-day Saints, South Hill Chapel, on Saturday, October 13th, at 11:00 a.m.